To Chimamanda Ngozi Adichie, author. From Katie McKenna. 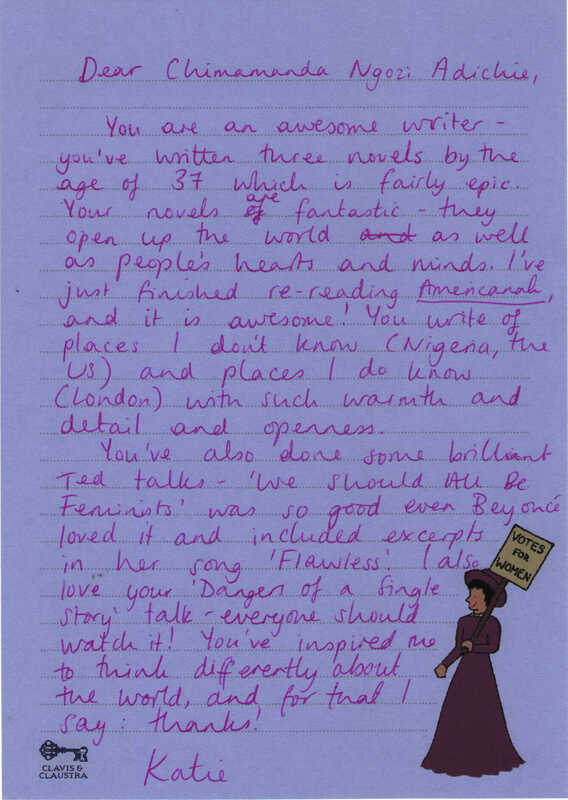 You are an awesome writer - you’ve written three novels by the age of 37 which is fairly epic. Your novels are fantastic - they open up the world as well as people’s hearts and minds. I’ve just finished re-reading Americana and it is awesome! You write of places I don’t know (Nigeria, the US) and places I do know (London) with such warmth and detail and openness. You’ve also done some brilliant TED talks - “We Should All Be Feminists” was so good even Beyoncé loved it and included excerpts in her song “Flawless”. I also love your “Dangers of a Single Story” talk - everyone should watch it! You’ve inspired me to think differently about the world, and, for that I say: thanks! author. Born 1977. More information about Chimamanda Ngozi Adichie.